Roasting tomatoes with plenty of olive oil produces rich caramelised juices. Add some salty cheese and fresh basil, and you have the simplest of summer pasta dishes. Preheat the oven to 200°C, gas mark 6. Place the tomatoes cut side up in a roasting tin. Drizzle with olive oil, then scatter with the sugar, garlic and seasoning. Roast for 20 minutes until the tomatoes are soft but still retain their shape. Turn off the oven, leaving the tomatoes inside to keep warm. Bring a large pan of water to the boil then drop in the pasta, broad beans or peas and the green beans. 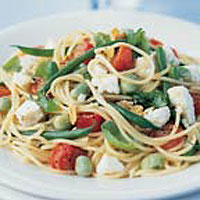 Cook together for 7-10 minutes until the pasta is just cooked and vegetables are tender. Drain well, then return to the pan, adding the roasted tomatoes with all their cooking juices, the basil and diced feta. Toss gently until just mixed, then serve immediately.